Use the mouse to spin the ship. Number row keys change the ship. Mouse wheel zooms the camera in and out. All of the models in this demo are owned by Microsoft and Digital Anvil (RIP). If you think they're cool, check out Freelancer. It's one of my favorite games of all time. I like the look of the ships. 1. The used, weathered look of the surfaces is good. If you want to improve that: think where you might want to concentrate grunge, sot, dirt and wear. Perhaps the exhaust or engine is dark from it's own fumes, perhaps the gun-barral is discolored, perhaps there are a few hits by meteors or missiles vissible on the surface. 2. The windows give a great sense of scale on the bigger ships. 3. Consider rendering an Occlusion map in your 3D-program, and bake it onto your existing textures. 4. putting one or two sound-sources on specific (!) locations of your big ships would add a lot of athmosphere. Imagine hearing a dark rumble getting louder when you get near the engines! 5. The thing with the purple "wings"? That is great stuff! 7. Many of your big ships have places where a small flyer could fly "through". Maybe encurage that (by making those a shortcut, by making them easy to navigate at typical "fighter"-speeds, ect. 8. You have a certain cylinder- or mill-stone-shaped design element on many ships. Consider animating that - perhaps simply by a shader instead of animating it with a script or within your 3d-tool. Same goes for those great purple wings! 9. 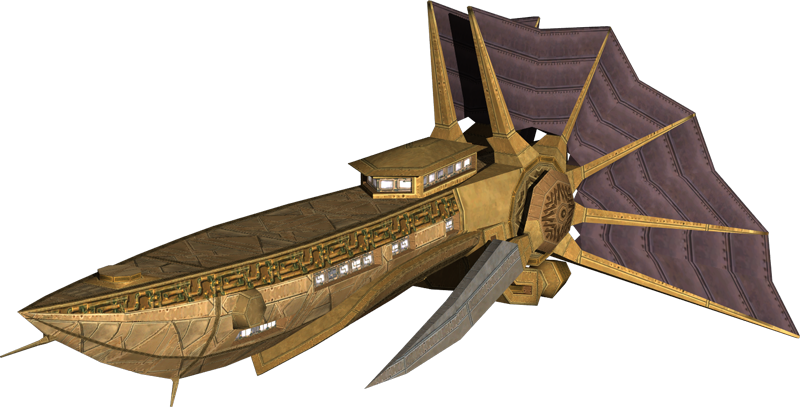 Can we get a big ship with purple sails? That would be soooo coool! I think you might like Freelancer. All of the models in this are ripped directly from that game, so I can't take the credit for anything that you're talking about. I still love Freelancer's aesthetics. All I can say is that it should have been made clear on here (it's clear everywhere else I posted about this) where the models came from. On the "purple sails", those are design element unique to the Japanese descended Kusari ships. All their ships have them to some degree. These models are fantastic, well done! You should really check out Freelancer. All the models in this are from there.